From a shoal of virtual carp swimming in the NGV's waterwall to a towering metropolis in Federation Court, more than 60 of Julian Opie's instantly recognisable works – renowned for their bold and pared back style – will be on display at the National Gallery of Victoria in the artist's first major Australian exhibition. Responding directly to the architecture of NGV International, Opie will create the largest ever work presented in Federation Court: a city of skyscrapers that stretch all the way up to the glass ceiling. Standing 13 metres high at its tallest point, the work creates an immersive metropolis where visitors can reflect on the urban environment. Presented alongside the cityscape will be a school of animated fish that appear to swim behind the falling water of the NGV's waterwall; stone sheep grazing, crows pecking and a horse galloping in the Grollo Equiset Garden; a reimagining of the famed Belgian fountain Manneken Pis in the NGV moat; and, in a series of figurative sculptures, a crowd of people walking are caught mid-stride in the foyer spaces. Drawn straight from the streets of Melbourne, a selection of Opie's recent walking ﬁgures of Melburnians will also be on display, offering visitors a unique opportunity to see their community rendered by the artist in his signature aesthetic. The exhibition will also survey more than forty of the artist's animated and moving image works, from 1993 to the present. An interactive exhibition for families, Julian Opie: Studio for Kids, will also be on display and feature hands-on and digital activities developed in collaboration with the artist. With a strong focus on Opie's interests in drawing, portraiture and observation, young visitors will learn new techniques and processes to create their own portraits and experiment with abstract images. Julian Opie and Julian Opie: Studio for Kids will be on display from 9 November 2018 – 17 February 2019 at NGV International. Entry is FREE. Further information is available from the NGV website, NGV.MELBOURNE. Julian Opie will be accompanied by a 264-page publication, featuring a lenticular cover image by the artist, essays on his practice and more than 180 colour reproductions. 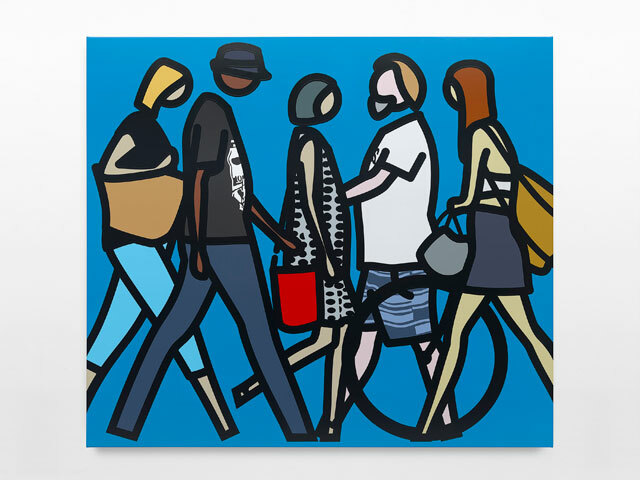 Julian Opie is supported by Michael and Emily Tong. Julian Opie: Studio for Kids is supported by Truby and Florence Williams Charitable Trust, managed by Equity Trustees, the Packer Family Foundation and the Neilson Foundation.